The Rev. 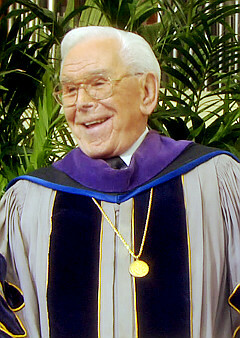 Robert H. Schuller, founder of Southern California’s Crystal Cathedral megachurch and host of the “Hour of Power” televangelism broadcast, announced Sunday he will retire after 55 years in the pulpit and his daughter will take over. 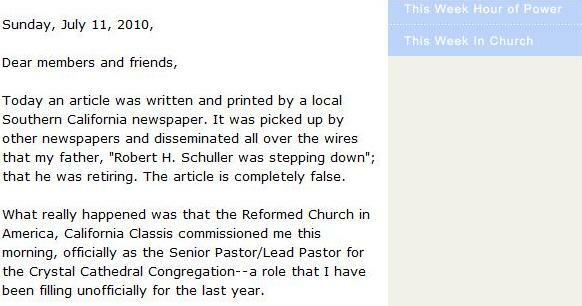 As you can see, Robert Schuller: Father Of The New Reformation, would be leaving us with yet another violation of God’s Word with his daughter pastrix Coleman. In my comments following the commissioning ceremony this morning, I made it very clear that nothing was changing as a result of the commissioning service today. It was merely an affirmation of the denomination. Further, I made it clear that it was my call to stand beside my father, to pray for him so he can continue to preach his unique and positive message from this pulpit for the rest of his life. So is he, or isn’t he retiring; only his daughter seems to know. But unfortunately, it would now appear we can expect more man-centered myth coming from Robert Schuller and his corrupt Chrystal Cathedral.